How Much Time Do You Spend on Instagram Daily? Some persons spend nothing less than 15 hours daily on instagram based on reasons best known to them. 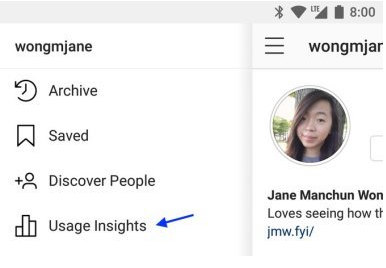 It appears the Facebook-owned picture and video sharing site will be releasing a feature called “User Insights,” and it will show how often an Instagram subscriber uses the app each day. This feature is similar to Youtube Take a break reminder, it offers the ability to set a time spent daily on the app and once the limit is exceeded, it will throw a reminder. The feature will also allow users of the Facebook owned app to limit how many notifications they receive from the app, which in theory could cut down on their usage of Instagram. The company is also testing a new hamburger button that opens a slide-out navigation menu on the profile; this might be where the usage insights show up. The company is currently perfecting the app for official rollout hence it has not been unveiled. So we are asking you again, how much time do you spend on insta gram daily? KweseiFlix: Pay N150 Per day to Watch FIFA World Cup Live – Is This Worth it? Sometimes once in a week. And because of our celebrities. I often use Instagram and anytime I do, I hardly spend up to one hour. am nt a fan… I dnt Jst love it imagine u sub yesterday n 4days the mb do finish on top wetin….. the thing dey swallow mb n I no dey gain anytin from them….. why be a fan then? I rarely visit Instagram so am a little less interested.